Have a basic "game plan" in mind of which attractions you want to visit, and some idea of the order you will visit them in. Take maximum advantage of FASTPASS. While we can't help you kick yourself out of bed for that early opening time, RideMax can help you with the other two important tips! In addition to your list of attractions, RideMax also allows you to enter your planned touring hours, the time you want to break for meals and shows, and your touring speed. Once RideMax has determined your touring schedule, it displays the results in an easy-to-read plan that you can take to the park. This plan includes the recommended touring order for your attractions, including FASTPASS pickup and return times, along with estimated wait times for each attraction in your plan. It all comes down to patterns. Almost all of the wait times for the various attractions follow a predictable pattern, though these patterns change depending on the day of the week and the season. As you might imagine, most lines begin short during the morning hours, and become busy in the afternoon. Later in the evening, though, some lines are still very long, while others dwindle down to a minimal wait. 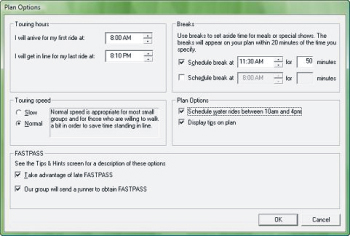 Since RideMax "knows" what to expect in advance, it is able to tailor the schedule to fit these patterns. So use RideMax, arrive early, and have a great day at the park! At its core, RideMax is an optimization program whose goal is to minimize the amount of waiting and walking someone does at Disney's theme parks. Anyone who has ever implemented an optimization algorithm in software knows how tricky this can be, and RideMax is no exception! The thing that makes any optimization of a sequence of events difficult is that once you have more than ten or eleven "events" in your list (or "attractions" in the case of RideMax) it becomes mathematically impossible to evaluate every possible sequence of events in a reasonable amount of computer time. For the mathematically inclined you'll note that the number of possible ride sequences is equal to the Factorial of the number of attractions in the list. So, if we add just one more attraction to the list, the number of possible sequences jumps from six up to 24. If we only were trying to ride three or four rides this would be no problem. But for an itinerary containing 20 attractions, we would need to evaluate 2,432,902,008,176,640,000 different ride sequences in order to do an exhaustive search! In order to work around this problem, RideMax uses a proprietary optimization technique that we won't divulge here, since we've invested a great deal of effort getting it "just right." Other factors that make this more difficult than your "typical" optimization problem are the fact that some rides open late or close early, and all of the FASTPASS rules must be considered as well. HOW DOES RIDEMAX ESTIMATE WAIT TIMES? 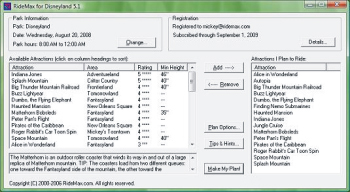 In order for RideMax to work, it relies on a set of wait time estimates for all of the attractions in the park for any time of the day on any given day of the year. As you can imagine, this is a LOT of data to keep up with! No, we don't live at the parks, but we've been sampling wait time statistics at Disneyland since 1998, and since moving to the Orlando area have conducted many wait-time observations at Walt Disney World as well. In order to generate the estimates required by RideMax we've sampled wait time statistics at different times of the year, from uncrowded weekdays in the "off-season" to very busy days in the middle of the summer. Since FASTPASS was implemented we've also been gathering FASTPASS pickup and return times during various times of the day at these different seasons of the year. Our goal in gathering these statistics is not to give RideMax a perfect picture of all of the wait times, but to get the estimates "close enough" that RideMax can generate an efficient itinerary. 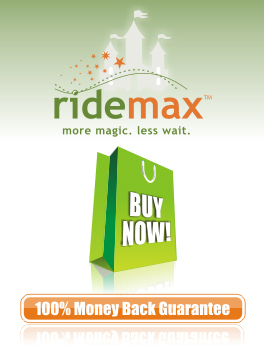 Our guarantee is simple: Order your RideMax subscription and use it to create touring plans for the dates of your visit, for the attractions you want to ride. If, after using these touring plans at the Disney park(s) you don't feel like they were worth the price of your subscription, simply contact us by email within 30 days of your purchase and explain the reason for your dissatisfaction. We'll then refund the full price of your subscription.